So he's a great president because he's been attacked? Puh-lease! Every president gets attacked--though not on the basis of race, which is unfair. But I'm so sick of people trying to claim that Obama couldn't be as effectively as h wanted because he was so strongly opposed. 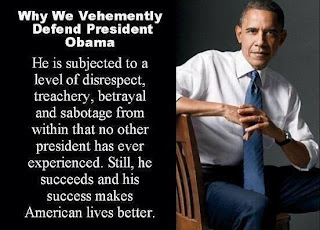 He was very effective in many ways that the average Americans do not want--like increasing drone strikes and drug arrests, unprecedented spying, bailing out banks, ignoring unions' rights which he'd promised to protect and keeping taxes low for the wealthy and for huge corporations. And before you squawk "The GOP opposed everything he did," both parties in Congress were democratic during his first two years--and was he ramming through a progressive agenda during that golden window? No! Though it didn't work, he was constantly reaching across the aisle to Republicans who'd sworn to block his every move. Which was a tactic rooted in sheer nonsense! Because he is a moderate Republican who drug the Democrats into the mud. I understand if you wince at the vicious attacks against him--especially those due to his race from ignorant bigots and those who exploit them, but personal attacks against him can't defend his policies. For which American lives aren't better.